When it happened, veterinarian Leanne Pinfold of Lort Smith Animal Hospital was utterly shocked. Earlier this month, some unnamed owners brought in one of the unhealthiest, saddest-looking kittens she had ever seen. "It was extremely weak and collapsed when it came in. It was almost non-responsive," Pinfold told Melbourne, Australia's Herald Sun. When informed of the kitten's diet, shock turned to incredulous stupefaction. The owners -- who were believed to be vegan -- had been feeding the kitten a strict vegan diet consisting of potatoes, rice milk, and pasta. Luckily, that was all the information the 11-year veterinarian needed to cure her furry, ailing patient. After resuscitating the kitten with a fluid drip, she immediately fed the feline meat. After three days on a carnivorous diet, it completely recovered. In light of this horrific happening, one abetted by sheer idiocy, I'd like to briefly discuss the physiology and diet of the domestic cat. Over thousands of years, cats evolved to be obligate carnivores; their bodies are designed to depend on the nutrients found in animal flesh. Moreover, they lack the enzymes necessary to efficiently digest most starches, plants, and vegetables. This is why most sensible cat owners know very well to not let their furry companions eat grass, as they will -- in all likelihood -- throw up, and do so all over the place. Cats are muscular little critters. With streamlined bodies designed for prowling, running, and leaping, they need a lot of energy to function. Cats also sport a resting heart rate of 120-140 beats per minute (compared to a human's of 60-100) and an internal body temperature of 101.5 °F (compared to a human's of 98.6 °F). Their energy needs are similarly higher than ours, almost double as a matter of fact! Cats require about 57.1 Kilocalories per kilogram of body weight each day, and growing kittens need even more. As such, domestic felines require fatty, energy dense sources of nutrition, along with plenty of protein to fuel their muscles. A massive study published in 2011 in The Journal of Experimental Biology uncovered cats' preferred diet. It consisted of about 52 percent protein, 36 percent fat, and 12 percent carbohydrate. 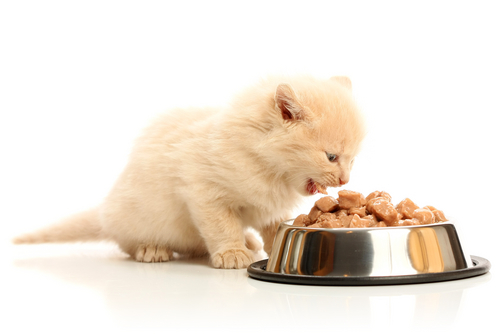 Now, let's review what the assumedly vegan owners were feeding their kitten. Potatoes are tasty (especially fried and topped with chili and cheese), but they do almost nothing for a cat. Ten percent of a potato's calories come from protein, and less than one percent originates from fat. Note: That's before they're mashed and slathered with gravy (which is definitely not vegan). What about pasta? It does have a higher protein content -- about 13 percent, but the rest of it? Eh, not so much. And don't get me started on rice milk. Suffice it to say, it's much worse than cat milk. Moreover, rice milk, potatoes, and pasta all lack the amino acid taurine. Since cats can't produce it, it's essential that they receive it in their diet. Otherwise, they will begin suffering from macular degeneration, which leads to irreversible blindness. Taurine is commonly found in many types of meat. Simply put, a typical vegan diet is absolutely nothing like what a cat should consume. And anyone who thinks otherwise is a fool, and that's putting it as mildly as possible. said. "You can't force your ideology on the cat."